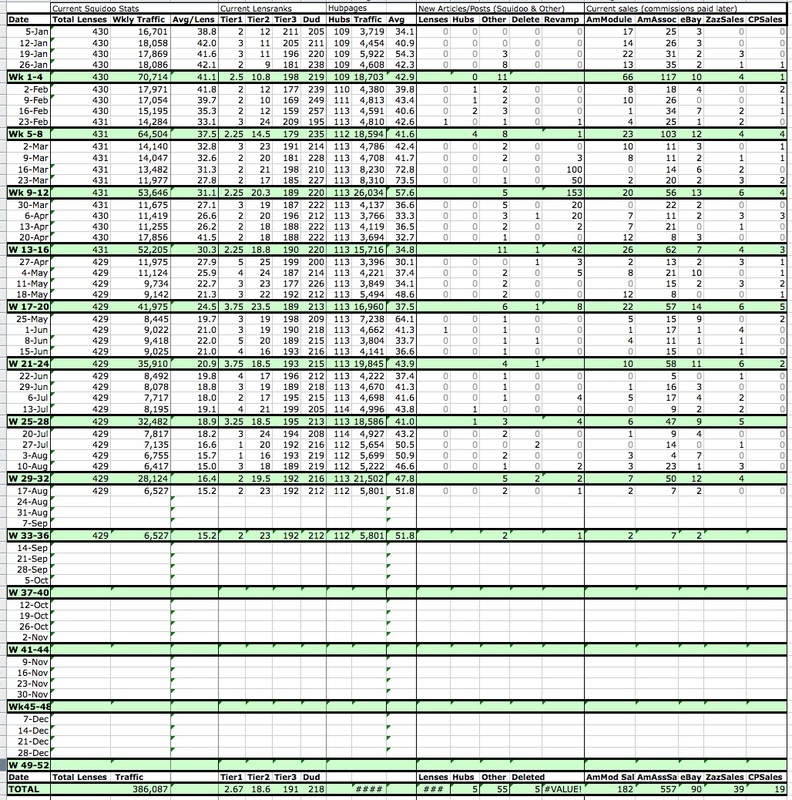 Hubpages’ new Idle Status should’ve removed a lot of low-quality hubs from Hubpages around Aug 29-30, giving Googlebot a little time to crawl the website and reevaluate it with some low-quality content cleared out. A Googler reported a Panda reset on Sept. 18. This is the standard Panda update where Google reevaluates all websites based on their overall spam to useful/unique content and assigns that domain a Panda rating, which then becomes a strong factor (a boost or a dampener) which it uses to rank individual webpages on that site. Our guess was that Hubpages’ “Idle Status” would give Hubpages a better overall Panda rating, and help it draw more traffic. This is dependent on whether Hubpages guessed correctly— idling the sorts of pages that Panda tends to downrank— and whether Googlebot has re-crawled and removed Idle hubs from Google’s index. Googlebot re-crawls stale pages less frequently than ones that are updated often, so it’s possible that Panda is still judging Hubpages based on what it looked like before a lot of those pages were idled. I mentioned in my last Hubpages vs. Squidoo post one hypothesis: Squidoo appears to me to be oriented much more towards family and kids products, so its traffic may go in lockstep with the parents-and-kids demographic. In the comments of that post, Simon of Hubpages asked me to clarify why I believed Squidoo had a greater lock on that demographic than Hubpages. I answered her at length, explaining the ways I think Squidoo has visibly and officially catered to that segment, but I’d add one more datum: Quantcast rates Squidoo as slightly above average in the “parents with kids” demographic, Hubpages as slightly under. However, the difference between them isn’t all that much. 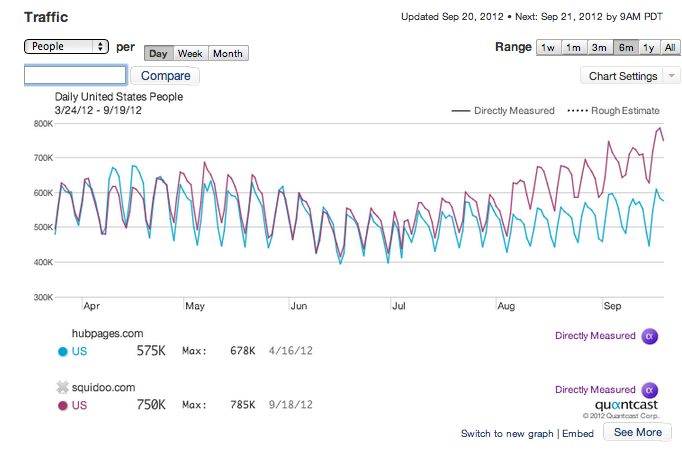 I’m not sure how Quantcast is able to measure demographics like that. Raw traffic I can believe — embedding a 1×1 image on each page and counting pageloads is a straightforward visitor counter — but I wonder how Quantcast is able to determine details of who is tripping the turnstyle. One thing has come home to me forcefully in my recent experiments on Hubpages. It’s obvious, yet I don’t think many people are taking advantage of it. Articles on Hubpages start earning ad revenue immediately. Articles on Squidoo can earn sales commissions immediately, but they only become eligible for ad revenue on the first of the month, not for their first partial month. 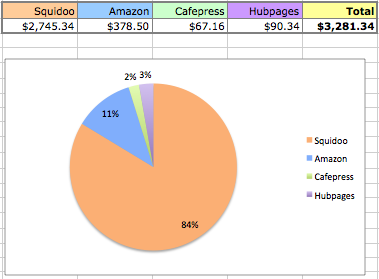 Also, Hubpages revenue is tied directly to impressions, whereas Squidoo’s ad revenue is paid indirectly via the tier payout system. What this means is that if you create a lens on a current, trending topic, you may not earn anything from the initial burst of traffic, and the later trickle of traffic after the main buzz is over may be too low to sustain the lens in a payout tier (or, at best, tier three). Whereas if you create a hub capitalizing on a current topic, you’ll get all the ad revenue from the initial traffic spike, then a modest trickle of revenue from the modest trickle of visitors that come later. I discovered this by accident when one of my hubs went viral and earned more in a week than all my hubs combined in the previous six months. I confess that I had that episode somewhat in mind when, on May 18, I rushed to get up a page about how and when to watch the May 20th solar eclipse. (The article is now rewritten to reflect what people want after an eclipse: cool pictures.) The 3500 visitor spike on May 20th easily doubled my earnings for the rest of the month. Post-eclipse, it’s getting 20-25 visits a day, not enough to pull in much ad revenue, but the pennies will become part of my overall daily income. After some thought, partly because I think it will get more visitors on Squidoo, and partly because I really was excited about this event, I created a different article sharing my solar eclipse photos on Squidoo. That’s tailored to the more community-minded, slightly less informational style of Squidoo lenses; also, significantly, I host the pictures on my own website and link to them so they get clickouts, capitalizing on Squidoo’s lensrank factors and greater ability to drive traffic by letting me name images. It will be an interesting experiment to see how these two articles compare in earnings over the longterm. I predict that the Squidoo lens will earn more. So, anyway, the point is: if you’re leaping on a trending topic, consider Hubpages for that initial traffic spike. 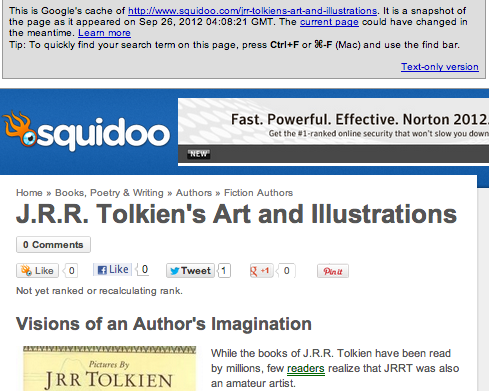 If it’s a topic that’s likely to get longterm traffic and clickouts, Squidoo is the better option. 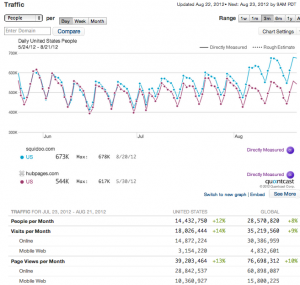 By the way, Google reran the Panda algorithm again on about July 25. What this means is that every month or so, someone at Google pushes the “Panda button.” Panda then reassesses the quality of content on each domain versus the amount of junk/spam on it, and gives that site, shall we say, a Panda Rating. That Panda Rating then becomes one of the factors Google’s everyday search algorithm uses to decide how well to list a page in search engine results. 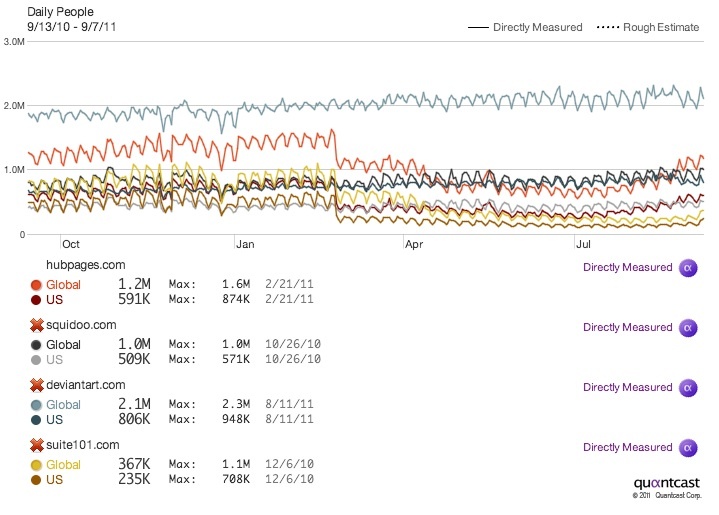 Panda’s rating is apparently a fairly strong factor, as traffic on each domain tends to rise or fall together, unless individual pages on that site have acquired enough other factors (say, backlinks from highly-respected sites) to offset the Panda factor. Now, wait, why did I put DeviantArt on there? A hunch. Just look at all that traffic! I think Zazzle members should have a DeviantArt account where you showcase some of your work and link to your Zazzle gallery and/or accounts on Squidoo and HP where you showcase more of your work. DeviantArt has an advantage over sites like HP and Squidoo, as you see. A social community that appeals to a large niche market (share your art! writing! photography!) gets tons of traffic if search engines didn’t care diddly squat for it. Members market it by pointing friends, relatvies, and peers to their stuff. 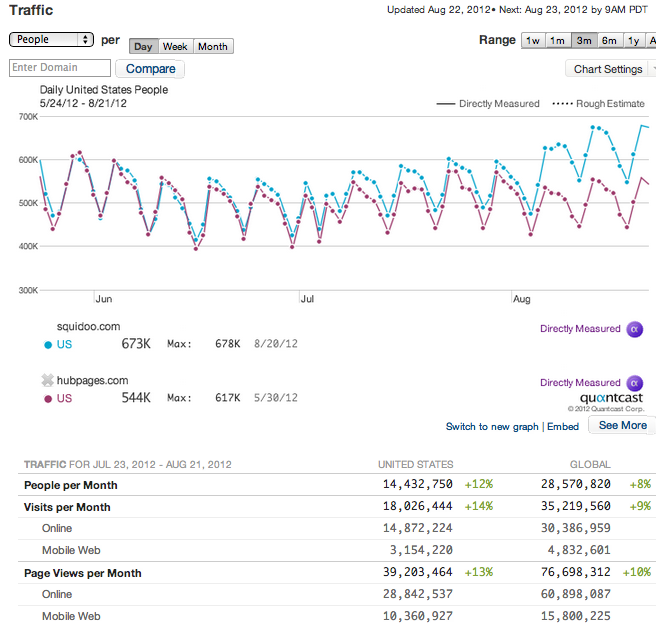 Search engine traffic, for DeviantArt, is a bonus on top of the social buzz it generates. Now, don’t all run out and create DeviantArt accounts for the purpose of spamming DA with backlinks. That won’t help much for SEO purposes. DeviantArt does not let you link directly out to some other website. Instead, when you enter links on a DeviantArt page like your profile, it’s stored in in a special in-house format, which is deciphered by a script only when a user clicks that link. I bet that Google, at least, is clever enough to detect the hidden URL in there and crawl it for indexing purposes: “Aha, there’s a webpage at http://www.squidoo.com/flynn_the_cat.” But indexing is not the same as ranking. This link probably doesn’t count as a backlink, when Google is checking backlinks as one of the factors it uses to decide how high up to list a page in search engine results. So why bother with backlinks on DeviantArt, if they don’t count for SEO? 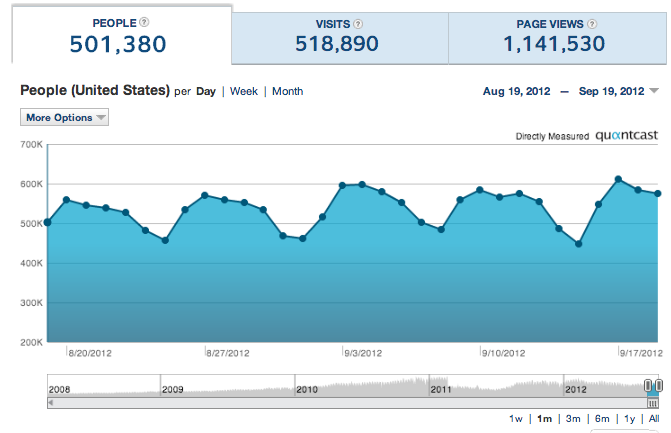 Pages on Hubpages, Squidoo, etc get indexed / crawled pretty quickly anyway. Because links have two audiences: (a) search engines, which may use that link to rank your page better in search engine results and (b) humans, who will click on links that look interesting or useful to them. In this case, your target audience is (b), people. 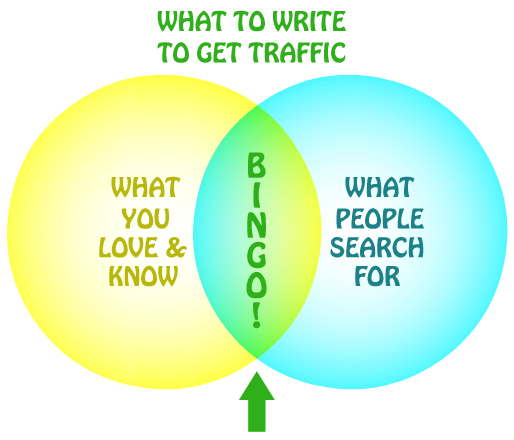 When writing backlinks for people, you have to give something they’ll be interested in. On DeviantArt, if they see an excellent portfolio of art, photos, or other kinds of creativity, some visitors will follow your link to see more of your creative work hosted elsewhere. Note that just because DeviantArt itself has a huge amount of traffic doesn’t mean your account will. As with Twitter, Facebook, or other social sites, you’ll only get traffic if you participate in and/or post really good stuff that attracts a following. But if you are an artistic person like Flynn here, and upload stuff regularly, you will attract a following. You could then direct some of that following to a Zazzle store, Squidoo gallery, or blog where you showcase your stuff. By the way, Digg, StumbleUpon, and many social media sites create outlinks the same way as DeviantArt: they are stored in a non-standard, in-house format, and then a script untangles them and sends the user to the real link. So everyone measuring links from those social sites as backlinks is missing the boat. 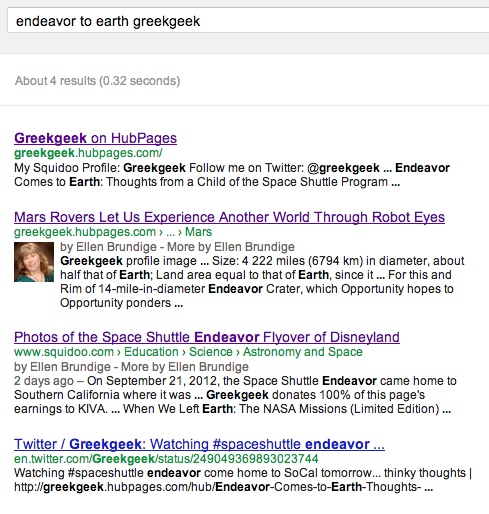 Those may help Google index a page, but they probably don’t count much as far as helping a page rank better. As with DeviantArt, those links won’t help much for traffic unless you’re an active, contributing member of those communities who has gained a following by frequently posting good stuff of the kind that community tends to like. This is another of my off-the-cuff observations not backed up by evidence, but I really like one approach Hubpages has taken to recover from Panda: establishing author-based subdomains. On the one hand, this means backlink churn. They’ve got redirects in place, but any time you shift the URLs of part of a website, there are bound to be problems. They’ll iron out over time. But on the other hand, this makes it much, much clearer who’s written what. Is everything in one subdomain scraped garbage? Fine, penalize it. But if another subdomain has unique, well-written content with sound links to related content, don’t give it a penalty because of Jane Q. Scraper/Spammer in the next domain over. It’s the same principle as web hosting from the last decade. There’s quite a mix of websites on the hosting service where I’m posting this blog, and search engines don’t judge us the same way. There’s one other piece of the puzzle that Hubpages and Squidoo are getting half right. Both Hubpages and Squidoo have added a hidden rel=author link from individual articles (lenses, hubs) to the member’s profile page. Good. That makes clear that the member is the author of all those pages. But as Marisa Wright of the HP forums reminded me, there’s something more to do. There needs to be a rel=”me” field on our Squidoo and Hubpages profiles to link to our Google profile, or Google won’t count the authorship, and our suite of articles, as our own work separate from the rest of the site, because the authorship won’t be confirmed. 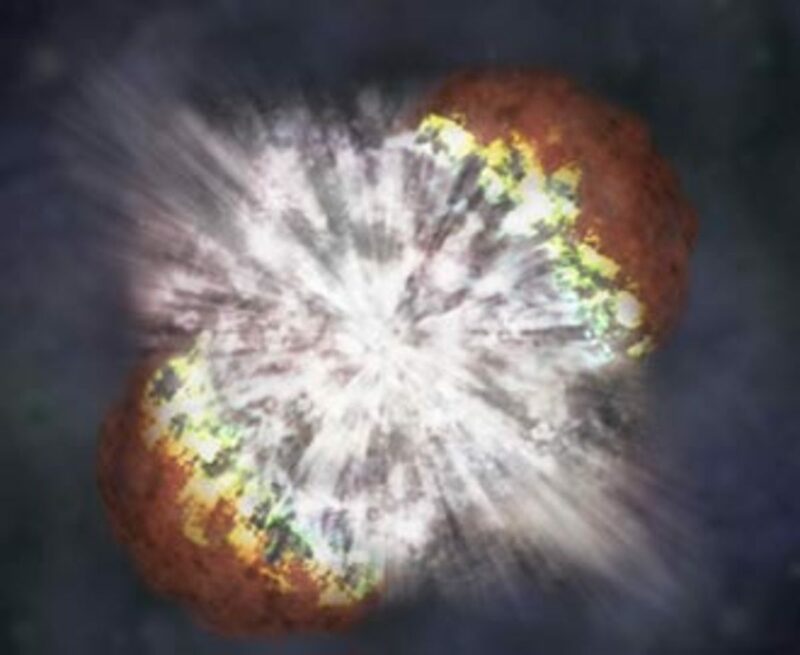 This is a backlink post because I just claimed my Hubpages domain and broke the miniscule bit of link juice my articles had accrued through Tweets (which Google follows to find new content, although it doesn’t consider them worth anything for ranking purposes unless you’re an “authority”).